This next group of men died in the ongoing fighting on the Gallipoli Peninsula after 25 April 1915 and before the next major offensive at Chunuk Bair on 8 August 1915. If anyone can provide photos or further information please contact me. 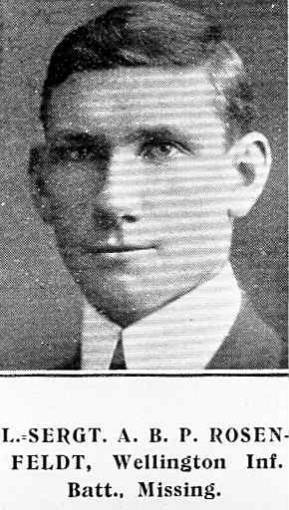 Augustus Bernard Paul Rosenfeldt – born 1888 in Manly, Sydney, New South Wales. Parents are Henry August and Martha Dyke. Augustus was a farmer working for his father at Dannevirke. His parents were of Te Aroha at the time of his death in 1915. He had already served as a volunteer prior to the war and was a lieutenant in the 17th (Ruahine) Regiment for 2 years. He enlisted at Masterton on 17th August 1914, and was given the rank of corporal in the Wellington Infantry Battalion. He left for Egypt with the Main Body on 16 October 1914. He was appointed to the rank of lance-sergeant on 5 May 1915. He was reported as missing on the 8 May and a Board of Enquiry in January 1916 reported that he was now believed to be dead on 8 May 1915, aged 27 years. He is remembered on the Twelve Tree Copse (New Zealand) Memorial, at Gallipoli, Turkey, Dannevirke War Memorial, Woodville War Memorial and the Te Aroha WW1 Memorial. August Harwood - born in Little River, Banks Peninsula on 27th March 1889. The son of John Henry and Selina Elizabeth. He enlisted in Auckland on the 21 August 1914, while he was employed by John King as a labourer at Te Aroha West. His next of kin is listed as A. G. Williams of Te Aroha West, his sister’s husband, Albert. He had been a member of the Wanganui Highland Rifles and the Hampden Volunteers. Embarked on the 16 October 1914 with the Main Body from Auckland as part of the 3rd Company of the Auckland Infantry Battalion. On arrival in Egypt on 3 December. He was hospitalised with laryngitis from 2 January to 11 January 1915, initially at Zeitoun Camp, then transferred to the hospital at Pont de Koubbeh. At Gallipoli, he was attached to the Ambulance Corps as a Stretcher Bearer. It was during these duties when he was taking a wounded soldier to medical attention, that August was shot in the back, the bullet piercing his heart as described in the Auckland Weekly News. August was killed in action on the 5 May 1915, aged 26 years, and he is remembered on the Lone Pine Memorial, Turkey at Gallipoli and the Te Aroha WW1 Memorial. 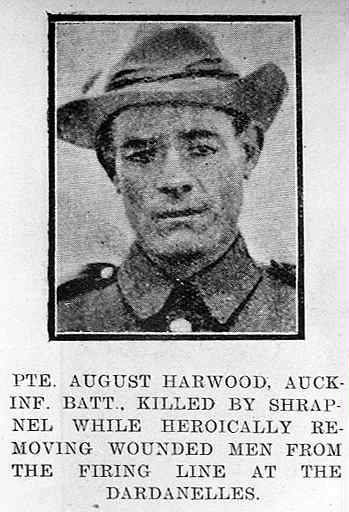 The men speak with affectionate regret and no little pride of Pte August HARWOOD, Ambulance Corps. He worked like a hero said Cpl SQUIRE of Mt Eden. No thought of personal danger ever deterred him. He was removing the wounded to safety day and night and mostly under fire. There was one very bad place on the right flank which we called ‘the death trap’, this was a long gully exposed fully to the enemy fire and containing practically no cover. Harwood had just taken a wounded man down this gully when in a part of the [area[ commanded by the Turks’ maxims, he was hit by a bullet which penetrated his back and pierced his heart. He died within a few moments. The gallant manner in which Private August Harwood, of the Auckland Infantry, met his death at the Dardanelles on May 6 is briefly described in a letter which an Auckland despatch rider, Private F. C. Garland, has written to his father. "One of our bandsmen, Gus. Harwood, a great, kind-hearted fellow, was killed by shrapnel striking him in the chest," says Private Garland. "He ran into the firing line and dragged out the wounded two at a time, and did this eight times before he was caught. I understand that he was recommended for the Victoria Cross." Private Harwood was a member of the Hibernian Band and was well known as a footballer at Invercargill. Two years ago he went to Te Aroha. He has two brothers fighting at the Dardanelles. Herbert Jesse Howe - born at Shapwick, Somerset, England, on 27 December 1879, the son of William and Charlotte of Shapwick, his medals were sent here. Before coming to New Zealand, he served eight years on the reserves of the Prince Albert's Somerset Light Infantry. He enlisted at Trentham 20 October 1914, joining the 6th Company, Auckland Infantry Battalion as a private. He had been working as a handyman and porter for R. L. Somers of the Hot Springs Hotel in Te Aroha. 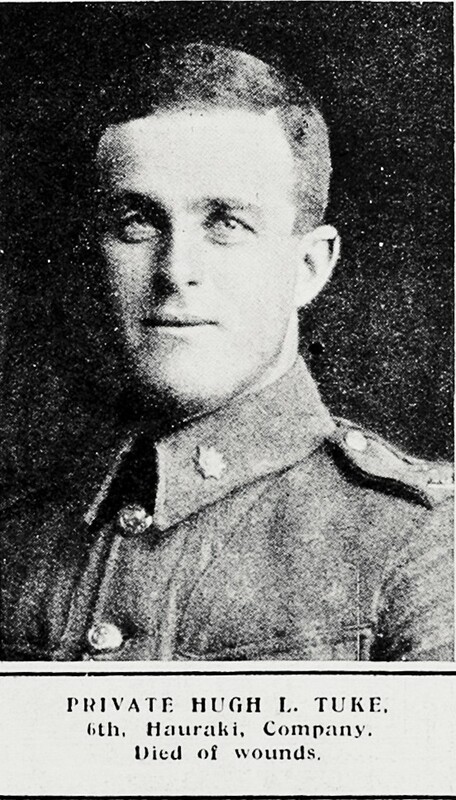 He left New Zealand with the 2nd Reinforcements on the 14 December 1914, arriving in Egypt on 28 January 1915. He received wounds during action to his right thigh and hip from a bomb on 6 June 1915 and died of these wounds on board HMHS “Sicilia” on 6 June 1915, aged 36 years. He is remembered on the Lone Pine Memorial, Turkey at Gallipoli and the Te Aroha WW1 Memorial and Whitianga memorial. Hugh Latimer Tuke - Born 6 April 1885 at Taradale. Son of the Rev. Charles Laurence and Mary Eleanor. He attested at Paeroa on 15 August 1914 and left with the Main Body on 16 October 1914, on transport No.12 the Waimana, arriving in Egypt 4 December 1914.He represented the Hawke’s bay province at cricket and football, and was a volunteer with the Napier Guards from 1901 -1906. He went the United States to a relative where he learnt farming and on his returned had a farm at Te Aroha, this farm was later to provide the family with an income after his death. He was enlisted with the 6th Company (Hauraki’s) of the Auckland Infantry Battalion. He was offered a commission but declined as he wished to remain in the Hauraki company. He had a bout of diarrhoea and was in hospital at Lemmos from 16 - 20th April 1915. He was shot in the abdomen and died of these wounds on board HMH Ship “Sicilia” on 6 June 1915, aged 40 years. He is remembered on the Lone Pine Memorial, Turkey at Gallipoli and the Te Aroha WW1 Memorial. One of the windows placed in the Lady Chapel of the St. John's Cathedral in Napier was dedicated to the memory of him and five other sons of the clergy who died in the war, although it is likely these were destroyed in the 1931 Napier earthquake. Norman Maisey - Born 18 July 1894 at Waiorongomai. Son of Robert Job and Jane of Turanga-o-moana. Norman attested at Hawera on 17 August 1914, when he was working as a labourer for H. Jones of Eltham. He left for Egypt with the Main Body on 15 October 1914 with the Wellington Mounted Rifles.He received a gunshot wound to the abdomen and died of these wounds on board HMH Ship “Sicilia” on 21 July 1915. He is remembered on the Lone Pine Memorial, Turkey at Gallipoli, the Te Aroha WW1 Memorial, the Matamata Memorial, the Turanga-o-moana Roll of Honour, and the Eltham War Memorial which are the Entrance Gates at Eltham Primary School, Conway Road, Eltham. This information has been researched by Andrea and found in free sources.. Simple theme. Powered by Blogger.